Implants or Dentures: What’s the Difference? Dentures, or artificial teeth and gums, are a common solution to replace missing teeth. They are typically made from a hard resin and are custom-designed to fit your mouth. Although not as strong as natural teeth, dentures are a suitable solution for many men and women with missing teeth, especially those who do not have a healthy and strong jawbone. 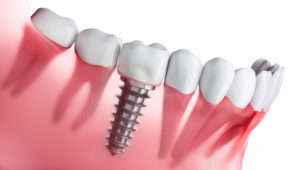 A dental implant, on the other hand, relies on a titanium post surgically inserted into the jawbone to provide outstanding support for a replacement tooth. The titanium implant fuses with the natural bone through a process called osseointegration to mimic the natural tooth root structure. Dental implants provide maximum strength and support and can restore the ability to eat, speak and smile with confidence. Long-Lasting – With proper care, dental implants can last 20 years or more! Compare that to dentures, which typically must be replaced every 5 to 10 years. No Slippage – The sturdy base of a dental implant means that replacement teeth with never slip or shift in your mouth. Natural Feel – Because dental implants mimic the natural tooth root structure and fit securely in the mouth, they feel more like natural teeth compared to other teeth replacement options. Maximum Stability – You can keep eating all your favorite foods worry-free with dental implants, which offer nearly the same chewing power as natural teeth. Visually Appealing – Dental implants are custom-designed in size and color to blend in seamlessly with your natural teeth. A full, beautiful smile can bring joy to you and those around you every day. If you are ready to restore your smile and restore your confidence, talk to an implant dentist in Lancaster today! Dr. Mahima Gupta has over ten years of experience helping patients achieve and maintain healthy and whole smiles. Her dedication to quality dental care and superior patient care led Dr. Gupta to be recognized as a 2017 Top Doctor in Lancaster. Patients with questions about the best options to replace missing teeth can visit the Lancaster Family Smiles website or call the office at 469-729-7707.